Konstanz is an old city located where the Rhine leaves the Bodensee, and it defines the border between Switzerland and Germany. 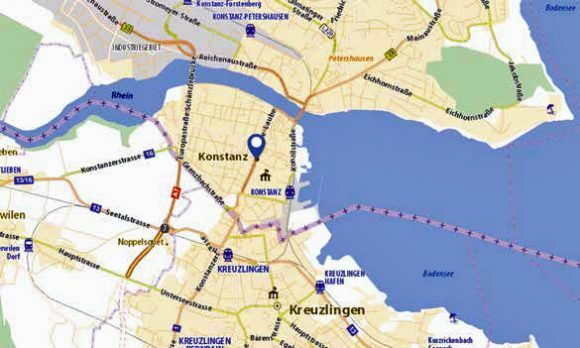 The oldest part of Konstanz is located on the Swiss side. The city has become German as a result of power struggles, just as Boris Gleb on the Norwegian side of the Pasvik river is Russian. Boris Gleb is located in the outskirts of the world. In the old quarters of Konstanz, history has tumbled back and forth between Celts and Romans, earls and emperors, bishops and popes, Catholics and Protestants, chastity and fornication. The German-Roman emperor Frederik Barbarossa, who fought everyone in sight in the twelfth century, negotiated several peace agreements in Konstanz before he started his last crusade and died. During the four years from 1414 to 1418, the Church held a council in Konstanz in order to end the turmoil between the pope and the antipopes. The reformist Jan Hus was promised free passage in order to defend himself. He was burned at the stake and his ashes were thrown in the Rhine. Today, we can read about the numerous brothels that prospered during the years the men of the Church dwelled at the site. During the Second World War, the Germans left lights burning during the night. This made the pilots of the allied bomb planes assume that Switzerland was below them, and they did not drop their bombs. Today, the Swiss visit Konstanz for tax-free shopping. At the railway station, VAT for the goods they have bought is returned to them. What has all this got to do with Acem Meditation? The spontaneous activity, especially the way it is experienced during long meditations. A city has its history, you have your history. The city’s history includes buildings, written documents, excavations, and landscapes. In a certain sense, it is dead. Your history is alive. Everything that has happened remains alive within you. Your history does not include buildings and excavations, but in some sense it resembles a city’s history. Celts and Romans have tumbled through our minds, in a sense. We may also wonder where we belong. Barbarossa has fought and negotiated peace agreements. Councils have tried to sort out the mess. We have burned heretics. We have experienced the tension between chastity and fornication. We turn on lights in order to avoid bombs. We cross borders to make good bargains. All of this is in our spontaneous activity, which is invited and given free flow through the gentle repetition of the meditation sound. We are unable to grasp everything that emerges, unable to draw clear pictures immediately. It may be stormy, or it may make us feel that we are not able to cope. But it is always part of our history, even when covered in fog. After meditation guidance in a weeklong retreat, we could all write a new part of our Konstanz history, seen in a new light, with new understanding, within a larger space. Meditators who have struggled with concentration techniques are relieved when they meet a nondirective technique like Acem Meditation, where nothing must be controlled or struggled with, where Konstanz is allowed to be just the way Konstanz is. Riddles may remain riddles. What is difficult is allowed to be difficult, and what is good to be good. In a way, Acem Meditation tells us that our lives must be lived within a larger context—with riddles that do not have clear answers, with longings that never find relief, with despair and conflicts that find reconciliation in a deeper understanding of human life. Have a nice trip to Konstanz! The quote is almost identical with the insights presented in the article. And I don´t mind the similarities – quite the opposite. Humanism, psychology, christianity and western philosophy has values and outlooks on life and its deeper meaning that is intervened and connected with each other, something that the similarities in the quote from wccm shows. It would be so interesting to read comments on this.